Hello guys, today I'm here with a really awesome guest post for author Eric B. Swanson's novel, The First Candle. There will be a giveaway at the end of this post (open to the US only) so stayed tuned for more information. I asked Eric to explain in great detail how he deals with writing in the genre of fantasy and all about spiritual forces. I'm honored to be working with such an amazing author in this guest post and giveaway! Martin Longbow is a minstrel in the village of Nooncrest near the Fission Mountains. In this post-apocalypse world he's fairly content, ignorant of the most important millennium mystery. The foundations upon which the minstrels have built their quiet refuge have begun to tremble, however, and they're not prepared for the quake. Martin is shocked into this new reality when his best friend, Jack, is savagely tortured. They seek refuge in a monastery where Martin is both saved and abused. Though he is not a planner, a fighter, or a leader, he understands there is work to be done to survive attack of the ageless, dark demon prince Agares and his legion of lesser demons. He must act as a candle that good men and women rally to air. With Alison, a maiden of wood lore; Mist, a savage fighter; Sam, a village leader; and Alex, a black sheik of the desert, the allies work together to defeat the teeming minions of Sax Mantis. 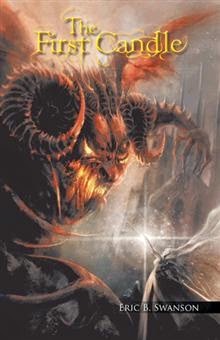 Ultimately, they must try to humbly enlist the aid of the mighty Cherubim and Seraphim to help stem the growth of the unwordly demon menace and try to save the world in which they live. Down through the ages, the spirit world has held the greatest unresolved mysteries and thus some of the most powerful stories. The fantasy genre allows me to write passionately about the spirit world in a more subtle, non-threatening way, and raise discernment about the real sources of evil. My new book The First Candle is about serving others, like the first candle lit in the Menorah serves to light the others. The book also probes into different depths of evil but is ultimately about its source. Fantasy can effectively develop situations to emote emotions of joy, fear, love, betrayal, and courage and expose their roots. In the book, I explore the effects of spiritual warfare through this created post-apocalyptic fantasy world, which bears resemblance to spiritual mysteries in our own. Ask yourself, are you more perplexed by good or evil spirits? Do you know why? Does ISIL stir your blood- can you recognize the spirit (not the people) of evil behind violence in the Middle East? Your own eyes bear witness to good people helping the poor, assisting those with Ebola, HIV, malnutrition etc, then being selectively pulled aside and slaughtered. There is no shade of grey, however many self-elect to rationalize evil. Evil spirits can manifest ideas in simple minds. In The First Candle, a powerful spirit, Prince Agares, moves humans to take joy in evil and terror. What I write about is the various manifestations of evil that have perplexed me, including war, terroism and sllavery. The First Candle depicts the concept that the evil lies are given to us and have a supernatural source. Through the book, I'm able to express some of my personal beliefs in an artistic, narrative way: God is truth; although there are many lies in our world, there is not one lie in God. May His Son's life, death, and resurrection testify against the many, varied and complex mysteries of evil alive today. Three copies of the book will be given away. So from this Rafflecopter widget, I am choosing three winners! Just follow the instructions down below to find out more on how you can enter!